28 Aug '09: I have been reading the http://dieoff.org/page125.htm website by Richard Duncan, and it is very thought provoking. 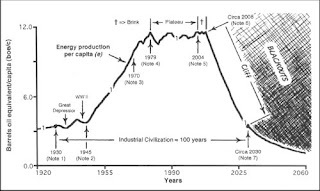 Richard Duncan's Olduvai theory is about the link between Energy Population and Society which states that the era of high energy consumption is 1930-2030. After that, there is not enough oil for what we regard as normal life, and beyond we face unimaginable difficulties and changes, and breakdown. The human conflict that follows that End of Oil will be just as much a problem as Climate Change, and many of the wars in the last 50 years have been linked to the control of resources, even if they seem on the surface to be linked to territory or religion. Skeptics say that we can gradually adapt to CC by migration, retreat from the coast, air conditioning, technology developments etc... But the flaw in this argument is that most of the adaptation process requires vast energy consumption - which will accelerate climate change even further. But end of oil will occur much more suddenly when peak oil suddenly drops off after 2020 and yet the population of the world has risen yet further. The graph of oil is like a steep cliff after 2020. Oil is essential to manufacturing particularly of computer and home products, and there will be a time when it is too valuable to burn in cars so has to be rationed. The energy from Oil is essential to the delivery of Food, and delivery of Water. The suddenness of this will cause mass unemployment and wars. As electricity is also essential to the stability of our society, it makes mass Microgeneration a very important capability, if only more people would do it. It also requires Rainwater catchment and Food cultivation on a massive scale by having it in millions of homes. I know someone in Texas, whose plight is typical for many americans living in low density cities. His car is unreliable, his journey to work is an hour each way, he can't get to work on time, so his boss makes him unemployed. The city is so vast and low density that there is no work near the home, and no transport to where there is work. Period (as they say in the US). The country is in trouble enough now, but in bigger trouble when oil disappears... or there will be more wars to grab the remaining reserves. Incredibly important - and courageous - work you're doing, David! As Thomas Friedman says: a Manhattan-type Project is needed for the world to go CLEAN. For insight and encouragement may everyone read EATING THE SUN by Oliver Morton. Plants through their chlorophyll: photons in - suguars out. PV cells: photons in - electrons out. The mad insistence on 'saving energy' alone will do nothing to climate or energy supply. The combination is the way forward: 20m2 of PV on a southfacing roof will provide one kWh within 30 minutes. That is as much as an A-rated washing machine needs for a 'coloured wash' at 60deg C.